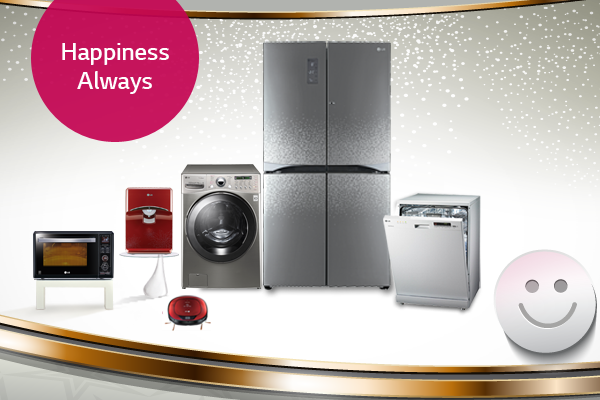 Happiness Always, with LG Home Appliances! With the changing lifestyles, the need for better living is rising evermore! It is no wonder, seeing this rise in the demand a lot of companies have popped up in the country to address the needs of the people by offering great number of products/services.With so many options and choices out there, it really becomes difficult for the customers to choose what will cater the best to them. Here LG sets a very different example by designing products that are specific to the conditions of India and needs of the people here. With a whole range of products which are specially ‘Designed for India’, we aim to understand and solve the problems of our consumers. Our EverCool range of refrigerators addresses the problem of frequent powercuts in India by providing cooling retention for extended hours in the refrigerator section during long power cuts. LG’s Large Capacity Washing Machine easily caters to the growing need of doing the entire laundry in one go! This is more relevant in India where we have the concept of joints families, besides the increasing polarity of weekend laundry in one go in Metros. Not just that, we have understood the love of Indians for Tandoori food and have come up with the World’s First Charcoal Lighting HeaterTM Mircowave Oven which provides the great taste of Tandoori delicacies at the comfort of your home. And of course, the need of safe drinking water is gaining more important nowadays. With its new range of True Water Purifiers, LG had gone beyond conventional water purifiers by not only focusing on True filtration, but by focusing on True preservation & True Maintenance. Though technology has always been at the heart of LG, but it is the drive to come up with innovations for a better future that keeps us going and bring you products that makes your life easy and comfortable. With LG Home Appliances, surround yourselves and your loved ones with happiness! I WAS A DIE HARD FAN OF LG AND USED MOST OF ALL APPLIANCES IN MY FAMILY FROM LG BUT…….. VERY BAD AFTER SALES SERVICE. KNOWING THE REFRIGERATOR IS ONE OF THE MOST IMPORTANT APPLIANCE OF ANY HOUSEHOLD THE AFTER SALES SERVICE IS PATHETIC AND TIME WASTING ALONG WITH ARTICLES OF USE. BUY LG IF YOU ARE GOING FOR A SECONDARY REFRIGERATOR OR IF YOU HAVE EXCESS MONEY TO THROW. REPEATED REMINDERS GIVEN FOR URGENT REPAIR BUT IN VAIN. REFRIGERATOR RS.50000 PLUS.. MODEL GL M 522. is this not a model of their company? NEW PIECE PURCHASED JUST 6 MONTHS BACK…enough of technical support need replacement. ASKED FOR REPLACEMENT BUT NO REPLY. ANY UNHAPPY CUSTOMER WILL TELL 10 FRIENDS ABOUT THEIR EXPERIENCE AND I I WILL TELL EVERYONE PLEASE DON’T BUY LG PRODUCTS. PLEASE PASS THIS TO OTHER PEOPLE TOO. Home appliance service is a good profession. You can be your own boss and start your own service center. Thanks for such a wonderful blog about washing machine service. Keep writing more. Thanks. I am very thankful to LG and i must prefer LG product to all my friends. I am using Two television and 2 refrigerator of LG from last 10 year and it cant get a single repairement till now. LG have awesome service which i experience. Hello Admin, I daily read your article, you have written amazing and helpful articles. this article also good. the way you explain the features of appliances it’s truly amazing. We, Repairing Man, provides Home Appliance Repair Services in Bandra and Maintenance services also at affordable Prices.